Today’s guest post comes from my friend, Matt Immerman. Matt is a recent graduate of The Doctor of Physical Therapy Program at Mercer University in Atlanta, GA. Matt has been in the health and fitness industry for ten years. He started out as a trainer helping people to get stronger, and more fit. Like many trainers, Matt had to work around his client’s various limitations. Knowing what exercise is appropriate for you (or your client) is vital to long term progress and injury prevention. Those who are new to weight training or exercise. Or those who have had a history of problems with their knees, back or shoulders and want to continue strength training without further aggravating old injuries. So you have decided to pick up weight training! Right on! The benefits of lifting relatively heavy weight are too innumerable to list. However, the other side to this coin is that there are potential risks (like with any physical activity) when you engage in weight training. Fortunately, there are many ways to minimize this risk by picking the right exercise for YOUR body. With a little knowledge you can enjoy the many benefits of strength training while minimizing the potential risks that come with it. 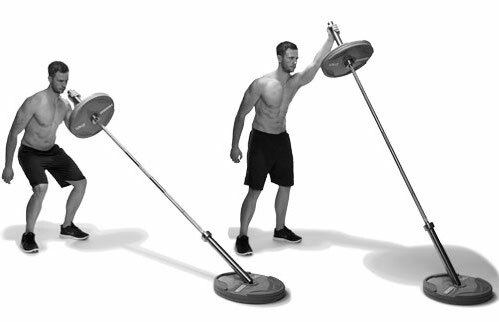 In this article, I will offer alternative exercises to the “staples” of weight training which include barbell squats, deadlifts, and shoulder presses. Now, before you completely tune me out, please know that I am a HUGE fan of these exercises. When done correctly with proper form they can be extremely beneficial in building strength, improving bone density, helping with balance, and the list goes on. However, not everyone is able to perform all of these exercises for a myriad of reasons… whether it’s a previous injury, tight muscles and joints, bony anatomy, or even lack of space or proper equipment available at your gym. And that’s okay! Just because something may be preventing you from doing squats or deadlifts or presses doesn’t mean that you still can`t train hard! These are great for working the quadriceps, glutes and hamstrings. You can also add plenty of resistance to this exercise simply by holding dumbbells in each hand. Unlike the back squat, your torso is vertical and the weight is down at your sides which means the lower back is not having to work as hard as it does in a back squat which means you can work the legs as hard as you want while `working around the back.` This is a great option for those whose backs don’t tolerate the back squat as well especially as the weight gets heavy. As an added bonus, the walking lunge can also challenge your balance and ability to decelerate which is key for sports as well as just staying fit and healthy. 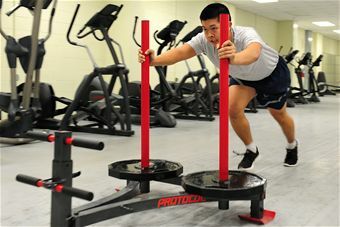 The sled push is an awesome exercise which also is fairly easy on the joints because it is purely concentric in nature. Furthermore, it is very easy to make sure your back remains nice and straight and that you are only using your legs to push the sled. This exercise is great for building lower body strength and as added bonus it gets you breathing pretty hard! Plus there is nothing more satisfying knowing you just pushed a ton of weight across the gym! Be careful on these though…get too good at these and all your friends will start calling you when their cars are stuck in the snow! This exercise is great for hitting the same muscles that you would target with a traditional shoulder press but with the different angle, you are much less likely to impinge some of the smaller muscles in the shoulder. Furthermore, it is much easier to keep your back straight and abs tight with this exercise thereby ensuring you are working the shoulder and not putting undue stress on the back by over -arching. Those were just a few examples of alternative exercises you can play around with and see what works best for you. Ultimately the best thing is to see a professional trainer who can help you along your path to fitness! Thanks for reading!